I was standing at the highest point near the start line of El Condor. Standing with jittery nerves. Over looking one of the best views I’ve ever seen. The atmosphere was electric, the smell of BBQ’s, the noise of buzzing helicopters and thousands of chanting fans. Every rock and mountain top was crawling with them, rally fans looked like coloured ants crawling over every rock in the distance looking miles out. It was breezy but warmish in the sun, yet we’re shivering. Not from the cold but from the combination of nerves and excitement. That was 12 months ago, when Kris Meeke went into the final stage of Rally Argentina, before taking his maiden win. ( Read Dan’s WRC Blog Argentina Adventure 2015) One year on and – although I’m in the comfort of my home sofa on the other side of the Atlantic, I have that same shivering nervous excitement. More of it in fact. Only this time, it’s because of a young chap who I have followed and been a big fan of for the last 6 year’s. Watched his struggles, his battles, his highs and lows. Most of which was just trying to work his way up, get the finance, the team, the car. The battles of just trying to get on the starting line in the first place. Chasing his dream which, at many times looked to be impossible. But the thing I’ve always admired about Hayden Paddon is his shear determination to never give up. He is always patient, calm, collective and confident. He always knew what he wanted. And he was going to get it, nothing would stand in his way. I’m no kiwi, but there’s something infectious about that to all of us Rally fans around the world. You can’t help but root for him, seeing all the hard work and effort he puts in. The heart and passion he has, it makes you want to believe in him. And seeing what seems like all of New Zealand’s 5 million inhabitants go crazy with their support, no matter what time of day it is over there shows how much his success means, not just to the Paddon family, but to his supporters back home too. Myself, like many other fans around the world, feel like we have been on that journey with him. The highs and the lows. We always want to be there to help, support and cheer anytime we could. And thats why, when Hayden Paddon and John Kennard took their first ever WRC win, it was so emotional to watch. We weren’t watching just another driver doing his job and winning a race. We saw a young and determine kiwi, take the biggest step toward achieving his dream that he has worked nearly his entire life for. There’s nothing better than seeing someone achieve their dreams. His a huge leap closer, to his dream to become a world champion. And just one final thought before I end here. Firstly, well done to the FIA, Rally Argentina organisers and spectators for a brilliant and safe Rally. And the final thought – 2.6 Seconds between a three times world champion. And an up and coming driver with just one full season of top WRC experience. Followed by 60 minutes of a live broadcast ending with a 14minute drive that had Millions of Rally fans around the world (including all of New Zealand despite being 4am) on the edge of their seat, some of which fell off their seat when seeing the car crunching rocks. With a estimated 65,000 fans at stage side on the last stage of the event. Which ended with millions jumping up in the air, some with tears of joy or was that just me? All with emotion and happiness. 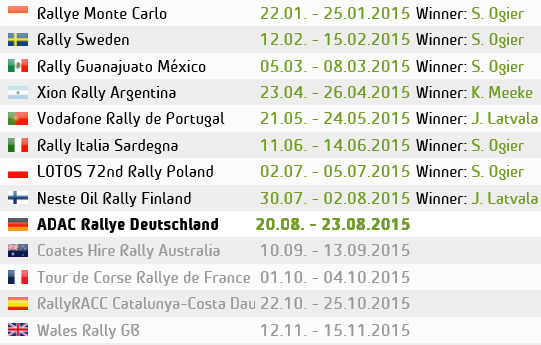 I think that shows that the WRC is back to being great again. No need for silly gimmicks, or changes to the DNA of the sport, no silly ‘shoot-out’ ideas needed here. Just three long hard enduring days of real racing, with real skilled professionals on real roads. Real tough conditions, where every mile and every second of the rally counts. That is Rallying. That is WRC. That is why we Love this sport!